Hopefully, you’ve enjoyed another fun summer out on the water with friends and family. But in the coming weeks and months, it’s a good idea to perform some general maintenance on your boat. 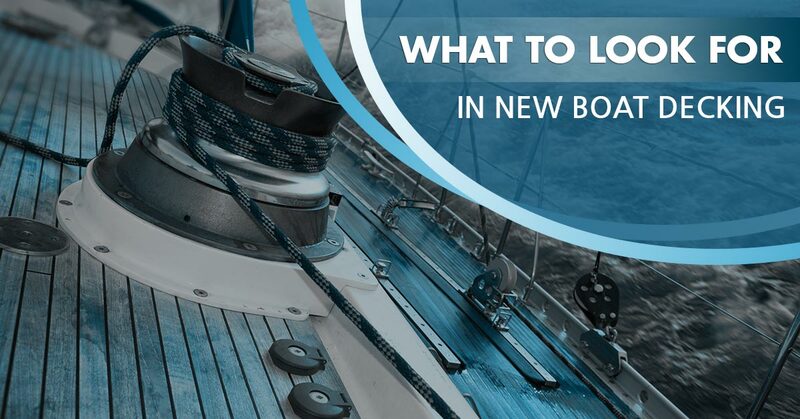 Whether that’s looking at the fuel system, electrical system, through-hulls, or safety equipment, you want to be sure that your boat is in tip-top shape heading into next spring and summer. What about the flooring of your boat, though? 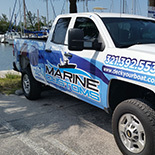 At Marine Customs in Florida, we understand how important it is to have quality marine decking for your boat. In this blog post, we will dive into what you should be looking for as you choose new anti-slip decking. Made from the best marine decking fabricator/installer – Quality boat decking starts with the manufacturer. You wouldn’t trust someone who isn’t certified and authorized to complete the job, would you? Unfortunately, many boat owners fall into this trap. They see online that someone is able to install boat decking and end their search there. Similar to other industries, our label of a marine decking fabricator and installer sets the professional apart from the novice. Can provide a non-skid solution for products besides boats – Take a moment to think about your personal watercraft, kayak, houseboat, or Stand Up Paddleboard. Could it benefit from some sort of non-slip product? Rest assured that Marine Customs has just what you need. 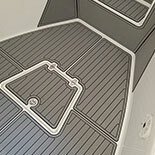 In addition to boats, we can also make any of the aforementioned items safer with our non-skid decking. 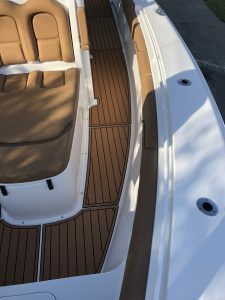 Made with comfortable, durable EVA foam – There are some boat decking products on the market that are constructed from lesser quality materials. When you invest in a solution from Marine Customs, you can feel comfortable knowing that your boat’s flooring will be comfortable to walk on. Because it’s made from EVA foam, you never have to worry about the material wearing out shortly after the installation. Features 3M peel and stick application – Marine decking installation should be easy. Unfortunately, many types of anti-slip decking are a nightmare to install. With 3M peel and stick application from Marine Customs, you can focus on enjoying your boat rather than stressing over it. Comes easily cut to fit – This ties in with the previous point. When your boat decking arrives at the door, you don’t want to worry about having to cut it perfectly in order to fit. At Marine Customs, we make it easy. Can be completely customizable – For many of us, our boat is our baby. We want it to not only look incredible but also express who we are. The reality is that many boat decking companies take a one-size-fits-all approach when it comes to design. They let you pick from maybe two or three colors and that’s about it. That’s not how our boat fabricator does business, though. We take the time to understand what exactly you want and then go to work to make that happen. For example, we invite customers to choose custom patterns, graphics, and logos. Feel free to take your pick from 16 attractive colors, ranging from Bahama blue to seafoam green. Covers cracks and other surface imperfections – We’ve all been in boats where there are countless cracks and other marks on the flooring. Especially if you take your boat out on the water regularly, natural wear and tear are going to happen. However, non-slip decking covers up those unsightly spider cracks with ease. Superior hydroacoustic noise attenuation – What the heck is this? Well, if you’re a serious fisherman, you can’t afford for your boat’s flooring to be noisy whenever you move around inside. At Marine Customs, we make it a point that our products reduce noise as much as possible. The majority of our customers prefer a totally customized and unique installation for their boat. We start the process by having our Custom Design Consultant creating a 2D digital scan. This is then imported into our CAD software where customization takes place. Next, the material is fabricated on a high precision CNC machine. We then complete the look by installing the finished product. Not in the Florida area but still interested? 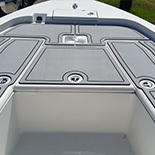 We are proud to offer a Semi-Custom option where customers can use a template kit to template their own boat. For high-quality boat decking, nobody beats Marine Customs. Call now to get started.